Robot Coupe J80 out of stock? It looks like we’ve gone too far again! Our promo codes have really gone down a storm. Since releasing our CRAZY discount codes last month there’s been a backlog of orders and Robot Coupe UK have NO J80 Juicers in stock until the end of September 2015! We’re over the moon but if you’ve ordered a J80, you may have a bit of a wait. We fulfilled all our customer orders so we’re safe there, thankfully. The guys in France are working hard to manufacture more J80’s to keep up with demand – we’ll keep you posted as soon as stock becomes available. We still have stock of J100’s and with our special discount code, you can afford to enjoy a more powerful motor and increased capacity with the J100. If you’re serious about juicing and want to be confident that your business can cope with demand, why not go large? With the Robot Coupe J80 out of stock it’s a great time to save on the upgraded model. 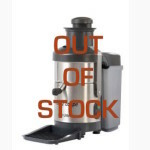 Click HERE for the Robot Coupe Juicer DISCOUNT CODES and instructions on how to purchase your Pro-juicer machine. Robot Coupe J80 out of stock – J100 IN STOCK! DON’T DELAY GRAB YOURS TODAY!